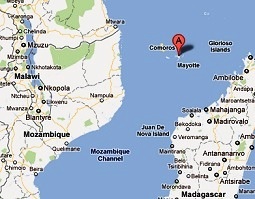 Anjouan is one of the Comoro Islands in the Indian Ocean (Mozambique Channel) located between Madagascar and Mozambique. The Island has a total land area of 163 square miles and a population of close to 300,000. The history of Anjouan dates back to around 1500 when the Sultanate of Ndzuwani was founded. Colonial presence in the Island began in 1816 when the Sultan requested French assistance to ward off threat from the Sultanate of Zanzibar. The Island became a French protectorate in 1886 and was annexed by France in 1912. Anjouan joined the State of Comoros when it became independent in 1975. It seceded from the Comoros in 1997 only to be reunified with the Comoros in 2002. Anjouan is currently part of the Union of Comoros as an autonomous Island. The last fifteen years saw it go through a tumultuous environment with coups and an invasion by Comoros armed forces in 2008. A presidential election was conducted on June 29, 2008 and Moussa Toybou, an engineer supported by the Comoran leadership was elected. The first stamps of Anjouan were a long set of nineteen stamps issued between 1892 and 1907. The set (Scott #1 to #19) catalogs for around $400 Mint and around $325 Used. They were the French Navigation and Commerce allegory design key types with the “Sultanat d’Anjouan” inscription in Red. Surcharged varieties of stamps from this set were also released in 1912. That set (Scott #20 to #30) catalogs for around $18 Mint or Used. The surcharged ’05’ or ‘10’ overprints are in Black or Carmine. One variety of the set features two spacings between the surcharge numerals. Another very rare variety is pairs with one without surcharge. Those are known to exist for Scott #21, #22, #23, and #30 and each such pair catalog in the $675 range. Stamps of Madagascar superseded Anjouan issues from 1914 onwards. Stamps of Comoro Islands superseded those issues from 1950 onwards. Anjouan Flag themed memorabilia such as License Plates, dogtag pendants, etc are popular items from the area. Rare items such as Order of the Star of Anjouan medals sometimes come to market.